A pilots first encounter with icing. 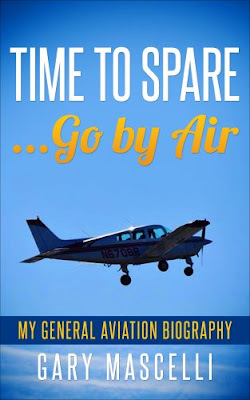 As my readers know I frequent various flying forums, always looking to learn something new. 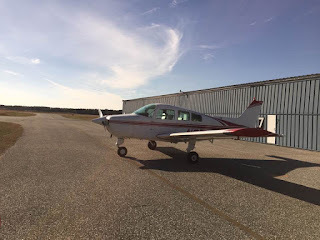 Today I want to share a post from a pilot that encountered ice for the very first time in his 20 years of flying. Training kicks in, and as my bride says, pilots do that pilot stuff they do. I started my flight Sunday night, as I flew south to a friend’s house. From my home-drone to the airport near his farm is only a 50-minute flight. I checked the weather before I left, and besides being nice on Sunday night, it was also forecast to be decent VFR on Monday morning for my return flight. It looked like the weather would get bad later Monday, with a mild snow storm moving in, but it wasn’t forecast to arrive until Monday at about 4pm. I got up early Monday morning, and checked the weather again. They were still forecasting VFR until about 4pm for my return flight. After breakfast my friend drove me back to the airport and we arrived right on time at 8:30 a.m.
My first clue that things might not go as planned was when I now checked the weather before takeoff: the front had sped up, and was now expected to arrive by noon. They were still predicting VFR until then. Okay, I’m cutting it closer now, but I still should arrive at home by 10 A.M., and the airmet sierra for my flight path doesn’t start until noon. I also knew that I’d be flying over an area where I have numerous friends and family that could always pick me up if I couldn’t go the whole way (not to mention it was only a 50 minute / 90 nm flight to begin with…I could practically uber the whole way if necessary). I took off at 9 a.m., just as I planned, and for 75 nm’s of the 90 nm flight, it was uneventful, with the worst of the weather just being hazy. When I was 15 nm South of my home field, I noticed the airport 20 nm WEST of my home field had just gone IFR due to low visibility…and I know the front was moving west to east, so it was only a matter of a short time before my field was IFR. But, I was just 15 nm away (and at this point, my home field was much closer than any other field), and my home field ATIS was still saying 6 nm visibility. While still listening to my home field, the very next ATIS broadcast said 5 nm visibility, mist. Now I should say, that I’ve always had a problem “absorbing” an ATIS the first time I listen to the broadcast. I usually listen to ATIS at least 3 times in a row, often more. The first time, I’ll get the local altimeter, and whether VFR or IFR. The next time, I make a mental note of the ceilings and the winds/appropriate runway. The third or subsequent time is when I start to hear the “other details” like the notes at the end, the temperature dewpoint spread, approach/tower frequency at controlled fields, etc. As I’m saying this, the windscreen starts freezing up like its covered in wax paper, save for two little 3” circles where my defroster is blowing. Looking out the side window, I watch as my red-colored gas caps seem to first turn pink then a chunk of ice forms in front of each cap (I would have expected it to form BEHIND the cap). As I start to align myself up to enter the pattern, I start to get the sensation that my engine throttle has been pulled back, even though it is still droning along at the same pitch/rpms. I look at my airspeed: I’ve lost about 10 knots, and I’m also slowly descending below pattern altitude, while unconsciously adding more back pressure. I add power (with carb heat, so I’m sure the effect of adding power is diminished) and more power, and finally full power, just to maintain altitude. I double check that I’ve turned on the pitot heat. I take a wide pattern, because the plane feels mushy to me, and fly right to short final without slowing down (which the plane felt like it wanted to do anyway). I flared, without flaps, and the plane mushed onto the runway MUCH MUCH faster than normal. I had to fly by looking out the side window, so maybe this added to the feeling of going faster, I don’t know. Luckily, I touched down more or less on the numbers, because it took a while to stop, not to mention it was also apparent that the runway was very icy. I taxi off the runway, over to my hangar, and shut down. When I get out, I would not describe the weather as “mist” but more of a heavy drizzle. I pushed the plane into my hangar, and took a couple of photos. I started up my hangar heaters and it took quite some time for the ice to melt off…so long, in fact, that I wonder how long it would take for the ice to come off if you were flying and changed to, say, +2 C air. So here are some pics…like I said, maybe it wasn’t as bad as I felt, but it still scared the crap out of me. I know I had a pucker factor just reading this one. This pilot did the right things to get the plane on the ground. Assess the situation, make the decision and move forward, pitot heat on, carb heat on, shallow wide bank turns in the pattern, increased throttle, and a no flap landing.Thankfully the pilot landed his plane safely. We can debate weather all day long, but we all know how fast things can change in the air. His closet field was in view and still reporting favorable conditions. I would have made the same call. It's amazing how long it takes to fly those last few miles, it seems like an eternity. I'm thankful pilots share their experiences for all of us to learn from. I think I'll practice some landings through the side window. As a side note, my recent duct work upgrade really provides excellent defroster and heat in the Sundowner. I was given permission to post this story and the pilots pictures. I have had the oil sump and cylinder heaters turned on Zero Eight Romeo for two days now, it was time to get the oil pumping. It's been really cold out and ugly overcast, at least until today. The sun finally showed its face and I took advantage of the preheats on the plane. Zero Eight Romeo was ready for some flight time and so was I. I checked TFR's and NOTAM's then headed to the airport. Mary has been under the wx, dealing with migraines, but felt a bit better today. With the zoo secure and Mary planning to get up, I decided to get some flight time in and then run errands when I got home. I took on twenty-five gallons to bring my total to fifty and then disconnected the heaters just prior to tugging the plane out to the ramp. My last to-do items were strip off the warm moving blankets, shut the hangar door, then climb aboard. As I taxied out I did a quick test for the video and called the house via the new audio panel PMA7000M BT. I should have held my position on the taxiway but I was moving along slowly and was clear in each direction. The Bluetooth works perfect, I dialed the phone from my recent list, hit send and there was my bride, loud and clear. The rest of the flight was pretty typical so I'll welcome you to ride along with today's video. My reading has slowed down a bit with the holidays but I finally finished this WWII behind the scenes look at the special relationship shared by Franklin Roosevelt and Winston Churchill. Meacham takes us back to their childhoods and provides a glimpse of what shaped the way they thought and how they reacted. Two unique men, both powerful leaders, from the greatest generation. These men shaped history with the decisions they made. Merry Christmas to all our readers and best wishes for a Happy New Year! To all of you that share our passion for flight we hope you enjoy the adventures that 2018 will offer. Since my work schedule is...well non-existent, I thought I would get some air time today. The initial plan was to fly to Wilkes-Barre, Pennsylvania and take care of my parents grave. 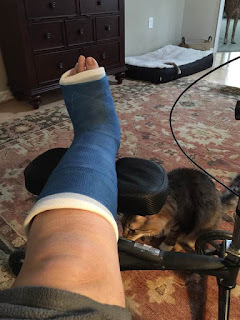 Sadly, I didn't make the customary memorial day prep or visit this year with everything that was going on with my foot. After looking at the TAF for KAVP I didn't want to tangle with the gusting high winds or the low ceilings since I am no longer IFR current. Instead, I decided to stay local, explore the coast and then find lunch. Mary wasn't feeling that great and decided to stay in bed to try and shake the start of a migraine that was coming on. I made sure the zoo was squared away then ran a few errands and finally headed to the airport. I sent a text to my friend Chet but he was just strapping into the dentist chair then getting ready to head to New York for the Holidays. I posted on FaceBook but no takers. Chris (Photographic Logbook) did respond and advised don't head his way they were expecting 50mph wind gusts. The airport seemed quiet today, off season and almost mid-week. I tugged Zero Eight Romeo out into the sun once my preflight was complete and waited on the fuel truck. I took on seventeen gallons to bring me back to fifty, I was ready to go. I did sump and again found a trace of water in my right tank. This will require monitoring, especially since my plane hasn't been outside overnight since the end of October. I launched off of runway three-two and enjoyed the cool temps, climbing out at a thousand feet per minute. I set a course for the Waterloo VOR (ATR) and tracked my way towards Lewes. As I approached I could see the Lowes store and my work site right next door. I took a few pictures then pointed for Cambridge, KCGE. Delaware Coastal (KGED) was still busy. I decided to steer clear and climbed to four thousand five hundred, watching the bee hive of activity on ADS-B. Once clear of the circus I started my descent for the restricted area (R-4006) with an operational floor of three thousand five hundred. I was flying along at or below three thousand enjoying the view. I traded position reports with a jet inbound for runway three-four at Cambridge. I crossed midfield, entered the left down wind and made a nice long landing for the last taxiway. As always, Kay's was busy. I ordered a BLT on rye with a cup of chili. The food and service was very good and I enjoyed the company around me, I love to people watch. I finished up and settled the bill then headed out to Zero Eight Romeo. I made a quick check of the fuel followed by a walk around before climbing in. I forgot to turn the camera on so no take of video. I did get some video heading east for home and managed to capture my landing at Ocean City. A fun day flying and 1.5 hours to add to my flight log. I've been working on my video editing skills and decided I really needed to up my game. I have been watching videos on creating thumbnails, intros, outros (yeah, that's a word)and looking for ways to increase my subscribers and likes. There have been a few changes to the blog, my YouTube channel, and I added an Author page to FaceBook to help advertise my two books. Advertising has been a learning experience that just keeps teaching, ok, reminding me how little I know about that process. All in all it's been productive and I hope that reflects on what's presented on both the Flight Journal blog and my YouTube channel. I spent some time putting together my annual year in review, happy with the final edit, I was ready to post it to my blog. Maybe the flying Gods smacked me down for so few hours this year, I'm not sure. Somehow, everything was deleted. I guess this is a reflection of how my flying went this year so I should just deal with it and move on...here we go. I started this year with a flight on new years day. I was excited to play with my new VIRB camera and the set up process. I hoped to figure out the settings, and if lucky, get some video posted. The video was fine, I needed to hook up the audio cable. Lessons learned. With my first flight in the log book I was ready to get checked into Peninsula Regional to have my foot surgery taken care of. I should mention that I really do not like hospitals and have a strong tendency to break out when I've had enough. I have a history and have caused hospital floors to be locked down while they look for me, honest, I'm not making this up. 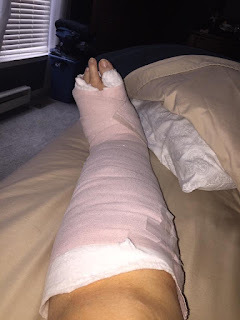 Surgery went very well and my Bride was there to provide support and keep me in my room. I was released Sunday and Mary drove me home after a brutal snowstorm swept through the area on Saturday. February started like January ended, more doctor visits and a new cast after staples were removed. The healing process was moving right along and the doctor seemed happy. I was happy just getting out and about even if it was for a doctors appointment. Mary loaded me up and drove Ziva and I to the airport where she could play and I could master the scooter. I found myself reading more and working on gathering stories for my manuscript. I am finally going to write that book that I have been talking about. I got busy typing away, working on putting my book together and working towards an imaginary deadline for my editor. I spent a lot of time sitting in the office and assembling a time line of sorts for the basic chapter layout. While I was typing away I also took some time to learn about the self publishing process, royalties, printing, shipping and advertising. This was a whole new world to me. I was also moved to weight bearing status! 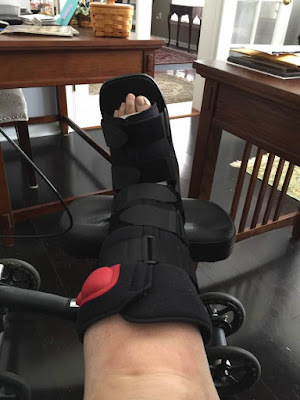 I lost the last cast and was put in a walking boot, the moon boot, as I liked to call it. I didn't forget Zero Eight Romeo while playing author, I was still the maintenance chief for my aircraft. The Beech Aero Club had some great deals and I ordered Landing gear shock discs (donuts), new rubber trim and a few other bits and pieces for my inventory. With the down time I was also able to put together some new buttonolgy posts. I enjoy working through various scenarios and learning new tips and tricks for my avionics. The month of April was all about weight bearing and trying to push myself to shed the walker and crutches. The Doc had moved my weight bearing status up and I started in late March, he was very happy with the fusion and how it was healing. 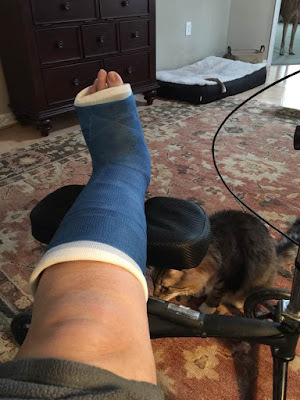 I was making serious progress toward walking unassisted. I was shifting gears from maintenance to pilot and the thoughts of shedding rust was now my focus. I reviewed my checklists, the POH and worked with my forflight and Garmin sim to help transition back to the cockpit. I returned to flight on May 3rd. I had butterflies in my gut as I was on the roll but I calmed down once climbing out. The pilot stuff kicks in and we do what we were taught to do, fly the plane. My first pattern was sloppy, altitude up and down and speeds a bit fast. I made my turn from base to final and I was waaaaay high and fast. I chopped the power and made it down to 400' before going around, yikes, I am rusty. I did a few take off and landings and felt back at home, left seat, by the time I was finished. I had been on the fence about getting a tug but finally decided it would help the repaired foot. With networking in full force I acquired a tug from my friends Adam and Dave from Wings field. Dave delivered the tug to me in Ocean City, saving a long drive. Thanks Dave! June was a busy month. I was back flying and trying to log some time while trying to get my final book edit approved and published. Time to Spare...Go by Air was available for pre-order. It finally happened, I was published. Now, it wasn't for the money or some wild dreams of crazy sales, I just wanted to cross another item off my bucket list. My flying was feeling more comfortable each time and Zero Eight Romeo experienced no side effects from three months of down time. 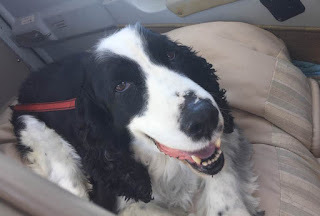 Mary and I got back to dog rescue missions and once again worked with the Mid-Atlantic English Springer Spaniel Rescue to get Cole to his forever home. We finished out the month with Mary staying up in Wilmington to help out with her brother after his back surgery. I flew a few missions to provide transportation. I also was finishing up my second book, The Realization of a Boyhood Dream. My second book, The Realization of a Boyhood Dream was back from editing, thanks to Melody, and I was ready to self publish. This book felt more polished, more attention to details that made the presentation all the better. I have Melody to thank for all her hard work and the many emails to help me along the process, she's a pro! July saw multiple trips to Wilmington and a few breakfast flights along the way. One of the most important flights of the year was my flight with Charles form N57. The Swift Kick I Needed got me back on track and wanting to fly. I had been dragging a bit and honestly lost my motivation to fly. It was a fun day flying with Charles and I can't possibly thank him enough for being my safety pilot. It was also fun to meet up with Bob. I love Ocean City but I miss having my flying friends close to home, it is the reason that flying hasn't been as exciting for me. Thank-You Charles for the motivation to drag the plane out and go fly. You have kept me focused and reenergized. August was family trip time. We made a short hop to the Jersey shore to visit Mary's brother and his family. They have a new place in Long Beach Island, Harvey Cedars. A beautiful town with plenty of things to do and see. Mary had a special bonus, she got to visit with her great nephew, Brennan. Mary and I had a family visit from my niece Katie,and Mike, along with our great niece Brooke. Mike wanted to fly so I was happy to tug out Zero Eight Romeo and do the beach flight up the coast to Lewes and back. Mary and I needed a vacation so me made plans for Sint Maarten. We went to Hawaii with our friends Pam and Ted and we all decided on the Island vacation to Sint Maarten. Air travel by way of American Airlines/Piedmont was a royal PITA. I did get to watch the planes land at Maho beach, that was on my to do list if visiting the island. When we returned from vacation I got a call from the company I did consulting for last year, they wanted me back. I accepted a position and will be headed back to Lewes, Delaware for DelDOT/DART. Mary and I finished out September with a trip to New Bedford, Massachusetts to attend the Beech Aero Club BACFest. We had a fun time even though we were forced to drive thanks to hurricane Jose'. A few milestones; we have owned Zero Eight Romeo for eight years, bringing her home from Texas in 2009. Zero Eight Romeo is also celebrating her 37th birthday! I saw some flight time, making the trip to spend time with my brother after his surgery. I also planned and attended the BAC fly-in to Ocracoke Island. Zero Eight Romeo survived a couple of months on tie down due to a repaving project that blocked access to the hangars. She's happy to be back in the nest and I gave her a spa day to make her presentable. It's annual time! I repositioned the plane to 58M, Claremont for inspection. With work and Mary's eye surgery I could only assist one day. The men at Cecil Aero did a great job and Zero Eight Romeo had no issues. I did have a few things done for preventative maintenance. After annual I repositioned the plane to KILG, Wilmington. I had an appointment with Red Eagle Avionics for the IFR cert and I added an upgrade while the plane was in the shop. My panel is now sporting a new PMA7000M BT audio panel and it sounds great. I love the Bluetooth feature and making calls for clearance delivery are unbelievably simple. I finished up November with a trip to the Dover AFB, Air Mobility Museum with my brother. We had a great time while the ladies shopped, black Friday shopping. Zero Eight Romeo is home after her annual, IFR cert and new audio panel install. I am trying to schedule Ivan from C.A.V.U. for a real spa day. Here is my year to date by the numbers. I did manage to add two new airports; 31E, Eagles Nest in New Jersey and KOKV, Winchester Regional Airport in Virginia.